The kitchen is so often the heart of the home. It is where our family gathers for meals, where we have our game night, where family bonds grow. We eat there, we laugh there—we feed our pets there. The inspiration for these delectable selections come from feeding our precious Cats in the Kitchen. Bring your cats to the heart of your home and share with us these savory cuts of white breast meat chicken and duck breast . . . delicate gravies, some with pumpkin for healthy digestion . 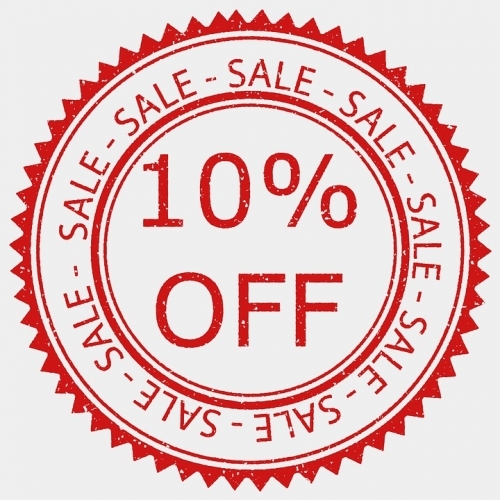 . . loins from tuna, salmon and mackerel . . . and lean cuts of beef —all fit for our kitchen carnivores. These recipes are among our most delicious offerings. 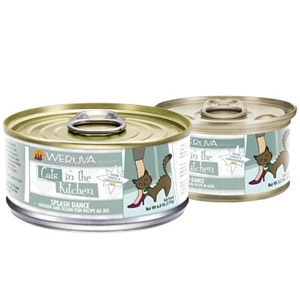 We hope your kitties love Cats in the Kitchen as much as the WeRuVa cats do—Webster, Rudi & Vanessa approved! 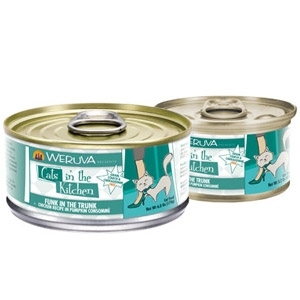 Weruva® Cats in the Kitchen Splash Dance Wet Cat Food 6 oz. The kitchen is so often the heart of the home. It is where our family gathers for meals, where we have our game night, where family bonds grow. We eat there, we laugh there — we feed our pets there. The inspiration for these delectable selections come from feeding our precious Cats in the Kitchen. Bring your cats to the heart of your home and share these savory cuts that are all fit for your kitchen carnivores. 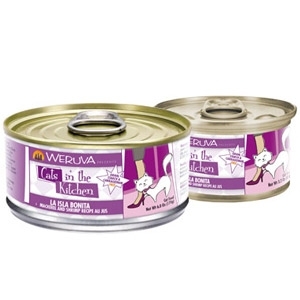 Weruva® Cats in the Kitchen Fowl Ball Wet Cat Food 6 oz. 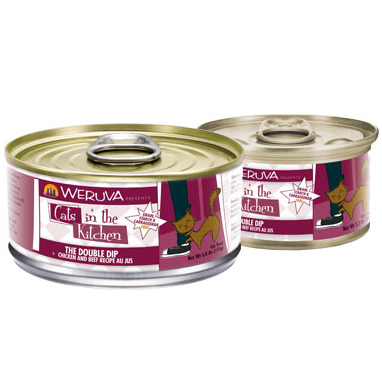 Weruva® Cats in the Kitchen Funk in the Trunk Wet Cat Food 6 oz. Weruva® Cats in the Kitchen Kitty Gone Wild Wet Cat Food 6 oz. Weruva® Cats in the Kitchen Goldie Lox Wet Cat Food 6 oz. Weruva® Cats in the Kitchen La Isla Bonita Wet Cat Food 6 oz. 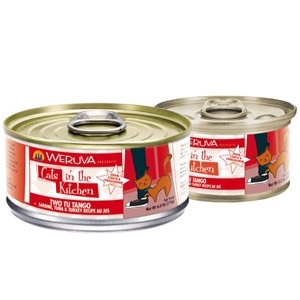 Weruva® Cats in the Kitchen Two Tu Tango Wet Cat Food 6 oz. 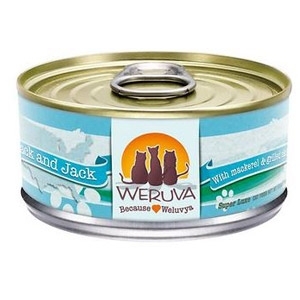 Your cats dance card will be completely full with Weruva Cats in the Kitchen Two Tu Tango Canned Cat Food! 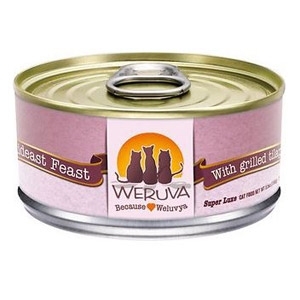 Containing tender cuts of sardine, tuna and minced turkey, this is a natural feast that your cat will fall head over paws for. 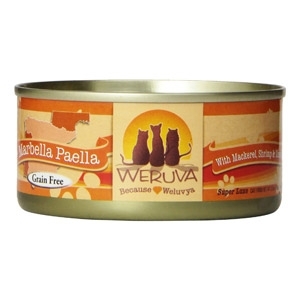 Served in a soft gel, Weruva Cats in the Kitchen Two Tu Tango Canned Cat Food is grain and gluten free. 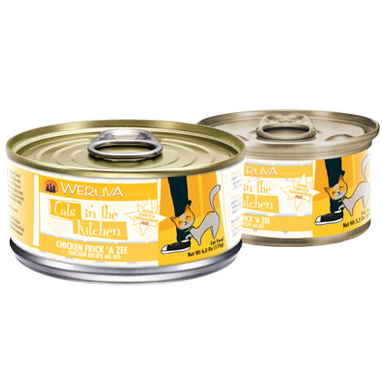 This meal is ready and primed to keep your cats health in perfect dancing order! 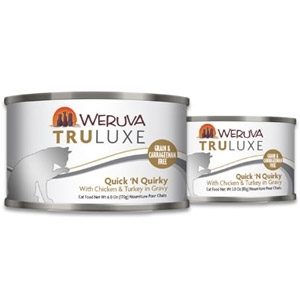 Weruva® Truluxe Quick ‘N Quirky Wet Cat Food 6 oz. Modeled after fan favorite Paw Lickin’ Chicken, this time we’ve thrown in some turkey. And though there may be plenty of kitties in Colorado and Washington state that will enjoy this formula, please remember: “I’m not chicken, you’re a turkey!" 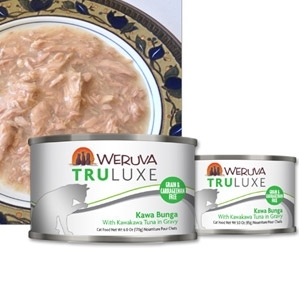 Weruva® Truluxe Kawa Bunga Wet Cat Food 6 oz. 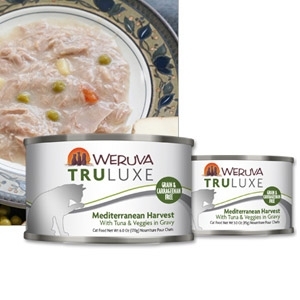 Weruva® Truluxe Mediterranean Harvest Wet Cat Food 6 oz. 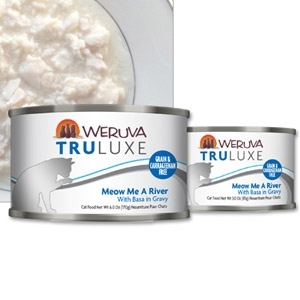 Weruva® Truluxe Meow Me a River Wet Cat Food 6 oz. 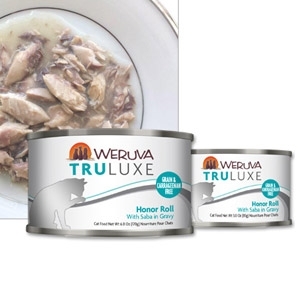 Weruva® Truluxe Honor Roll Wet Cat Food 6 oz. When your cats are on a roll, it's time for Honor Roll! Featuring Saba, a choice mackerel you often find in sushi rolls. 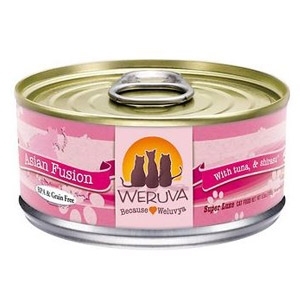 It is our honor to provide you a new flavorful option in gravy for your kitty that is derived from sustainably sourced Saba and Saba alone! Get high marks with your cats today! “And I think to myself, what a ‘wonderful’ fish.” Tilapia nilotica, “fish of the Nile,” plays a fascinating historical role. Evidence, in the form of hieroglyphic paintings and carvings suggest that not only was tilapia harvested by ancient Egyptians, tilapia was the food of many Pharaohs. Because biblical tradition holds that tilapia was the fish Jesus multiplied and fed to the masses, some have come to know tilapia as “St. Peter’s Fish” or “Wonder Fish.” 3 oz. Hula mackerel! Bring your leis and get your dance on! Made with a touch of pumpkin to help with digestion and loaded with omega-3. 3 oz. Your kitty's favorite recipe is back! A delightful blend of wild caught, white meat tuna with potato, peas & tomato. 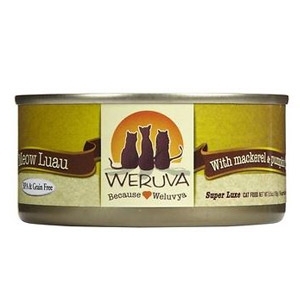 This is one of Weruva's original 8 flavors and one of the best sellers...must be 'cause those finicky furballs that we love so much keep meowing for it! 3 oz. Mack & Jack you Omega-3 maniac! Made with mackerel and skipjack tuna. With the United States consuming nearly a third of the world’s catch, simply put, skipjack is the most popularly consumed tuna in the world, surpassing albacore nearly eight times over. 3 oz. A terrific pacific treat, made with red meat tuna and shirasu. Shirasu are baby anchovies. Translated as “white child” or “white small” perhaps the smallest fish available on the market, shirasu have become a traditional part of the Japanese diet. Like many people throughout the world eat cheese with their wine, many Japanese consume shirasu with their sake. 3 oz. If you can’t bring your cat to Spain, bring Spain to your cat! Rich in Omega-3’s, let kitty enjoy a paella mix of mackerel flakes, whole calamari, baby shrimp and mussels. Everything ut the kitchen sink. Fabulosa! 3 oz. Howdy mate! Get your taste of Australian seafood here. Made with exotic Australian seafood including barramundi, an Australian sea bass and trevally, a reef dweller. Like a boomerang your cat will keep coming back for more. 3 oz. 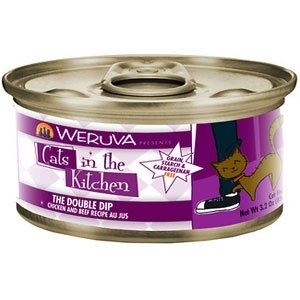 Your cat loves double-dipping with Weruva Cats in the Kitchen the Double Dip Canned Cat Food! Filled with two incredible choices of meat proteinschicken and beef---your cat will get double the health benefits and double the taste! 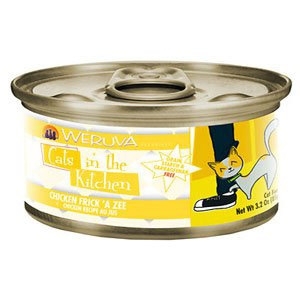 Weruva Cats in the Kitchen the Double Dip Canned Cat Food will have your cat coming back for seconds so be sure to hide the can! 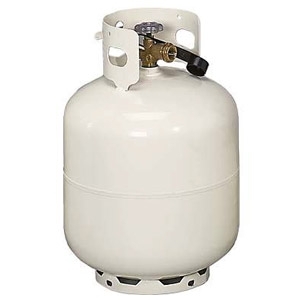 3.2 oz. 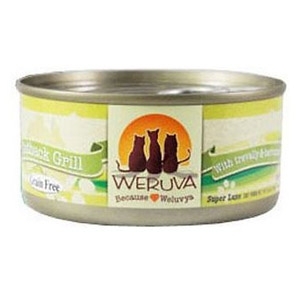 Treat your cat to meaty meal with Weruva Cats in the Kitchen Chicken Frick A Zee Canned Cat Food. It's packed full of healthy goodness like premium cuts of white chicken - giving your kitty the protein she needs. 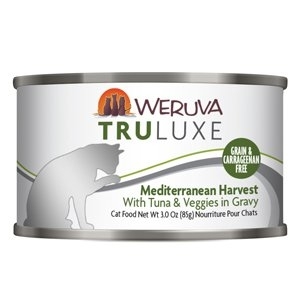 This all-natural meal is free of grain and gluten - a perfect alternative for cats with food allergies. A natural source of Omega-3 and Omega-6 boosts her immune system while giving her a beautiful coat. A powerful blend of vitamins, minerals, and antioxidants boost your cat's overall health. 3.2 oz.